There are 7 Pentagrams of Blood that have been identified by SOLLOG in his occult writings. For thousands of years humans have been attracted to these Solstice Lines that form the 7 Pentagrams of Blood and built many monuments and some of the world’s greatest cities have been on the lines that form the 7 Pentagrams of Blood. These lines have witnessed MILLIONS OF HUMANS KILLED In wars, terrorism, murders and natural disasters over the millennia. Read his BOOK titled PENTAGRAM OF BLOOD now to understand these Death Stars or Pentagrams of Blood and how they have existed for thousands of years and are tied to SOLSTICE LINES. The main Pentagram is over North America or the USA and the five lines have been soaked with the blood of victims from so many mass death events recently that it’s hard to keep track of. 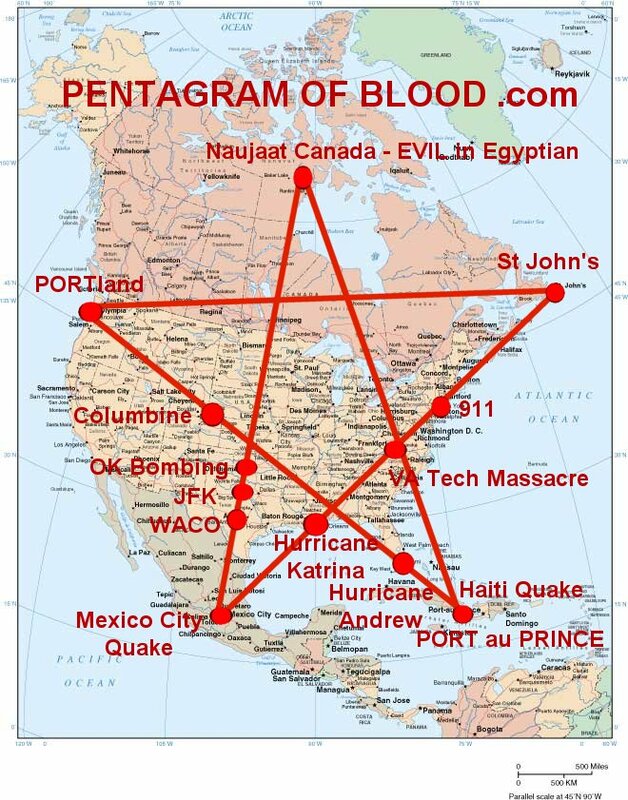 Events such as 911, Katrina, many school shootings including Columbine, VA Tech and Sandy Hook have all stained the North American Pentagram of Blood with sacrificial blood. Cities located on the North American Pentagram include New York City, Boston, Washington DC, Baltimore, Miami, New Orleans, Dallas, Houston, Oklahoma City and Portland in the USA as well as Mexico City in Mexico and Port au Prince in Haiti where earthquakes have killed many thousands over the recent past. There are 6 more major Pentagram’s of Blood and some have ley lines of death that go back to ancient times and all of the Pentagrams are connected to major Solstice Lines. 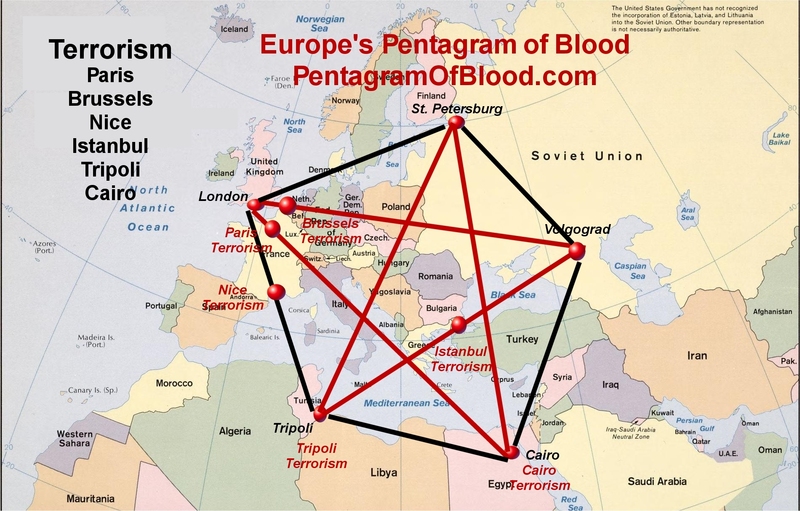 The Pentagram of Blood over Europe has been where humans have killed each other for thousands of years and include major cities such as Paris, Rome and London as well as Stone Henge and the Pentagram is tied to the ancient Pyramids of Giza near Cairo. 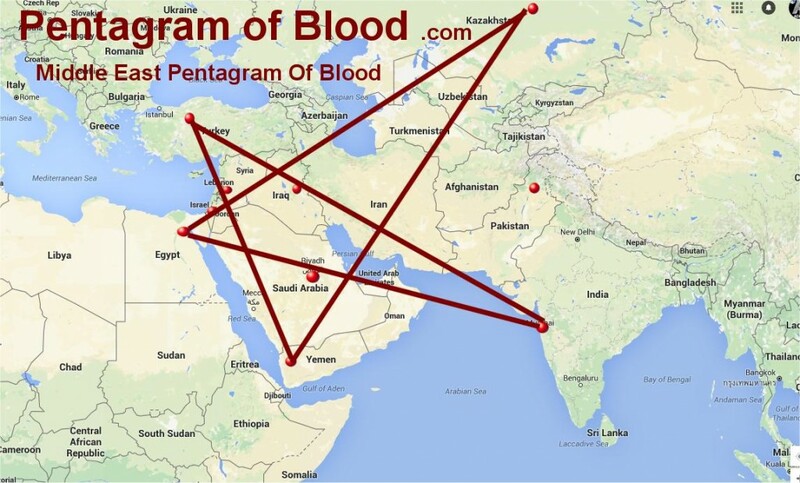 The Pentagram of Blood over the Middle East includes Cairo and the Giza Pyramid Complex as well as many ancient cities where human blood has soaked the earth for millennium’s. The cities include Cairo, Jerusalem, Baghdad, Damascus, Riyadh and Sanaa.